Want to be notified of new releases in aui/font-spider? Font-spider is a compress tool for WebFont which can analyze your web-page intelligently to find the fonts out which have been used and then compress them. Font subsetter: Our tool is based on HTML and CSS analysis and completely running in local so that. Font converter: Support woff2, woff, eot, svg font format generation. 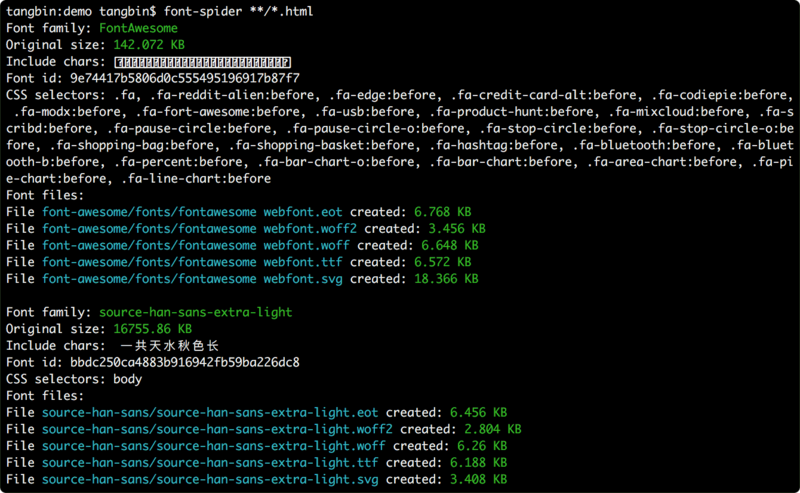 Attention: the ".ttf" file must be existed which is referred in src property of @font-face, and our font-spider will automatically generate other formats of font. One or more web-page addresses which support the http form. The ".otf" format fonts should be transfered to ".ttf" format firstly, so that we can start our compressing work. Only the HTML and CSS files which is encoded by utf-8 are supported.